Posted February 20th, 2016 by Mobile Music School & filed under Music Lessons, Percussion Lessons. Recently the Mobile Music School began a short drumming programme in Gaelscoil na gCloch Liath. This has been our third consecutive year working with this school through Irish and it was a real pleasure to see so many familiar and excited faces! This year we worked with senior infants, second class, fourth class and fifth class. 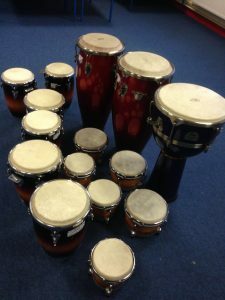 The children participated in our set ‘Let’s Drum’ workshop programme, which enabled them to learn about the percussion family and other instruments of the orchestra. With this programme the students developed an awareness for and understanding of “the beat”. They also learned all about different rhythms, and were able to form samba bands and percussion ensembles. It was so satisfying to receive this kind feedback as it has been our aim to adopt this teaching style since we first established back in 2011. The programme was such a success that the school has already confirmed a booking for January 2017.